This month, Pamela Murphy is a featured artist at Fine Line Designs Gallery, located just north of Ephraim, for her seventh season. A full-time Door County resident since 1993, Murphy’s résumé boasts international and national representation, as well as exhibition and solo shows, in places as diverse as North Carolina, Massachusetts, Georgia, California, Alabama, Pakistan, and India. But Wisconsin is home. Of her extensive representation, Murphy states, “I’ve been very lucky.” Many of the galleries that have exhibited her work found her, viewing her work at other exhibitions and contacting her to show in their space. “I’ve been very lucky,” she repeats. Continuing, “Knock on wood.” She searches for a moment, leaning back in a black armchair before discovering the wooden armrests under her elbows. She taps on the wood twice, smiling. A small white dog, suspicious of my purple flip-flops, stands tense near Murphy’s crossed legs, in the barn/studio space, which is full of the paintings yet to be delivered to Fine Line Designs Gallery. 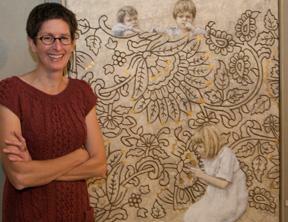 Both her studio and her paintings have a haunting, captivating, and nostalgic quality – aged, and minimalist. 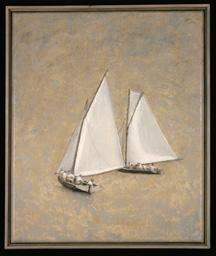 The images – a young girl, wearing a white dress and red Mary Jane shoes, clings to an oversized rabbit; two woman in black swim caps and teal bathing suits sit on their sides; and two sailboats lean into an opaque sky – are familiar, like an aged postcard or black and white photograph from a grandparent’s photo album, containing stories and evoking emotions that entrance the viewer. The images represented may be just that, an old postcard or discarded photograph Murphy collected at a rummage sale, an antique store, or from friends and family. 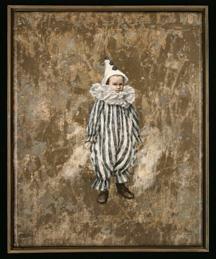 “Little Clown II” by Pamela Murphy. “I have collected thousands and thousands of old photographs, even before I began using them as models,” she explains. “I think I feel bad that family members have forgotten who [the figures in the photographs] are. They have become strangers. Yet, they seem familiar to me and viewers, who see themselves or their grandmothers.” She opens the top drawer of a tall, silver file cabinet, stuffed with photos. Regarding art, nostalgia falls in one of Murphy’s earliest memories – painting the bathroom wall with her mother’s red lipstick. “I was probably punished,” she laughs. “I probably got some crayons out of it.” Born in Madison, Wisconsin, where her father attended school, Murphy and her family, who Murphy states, “strongly encouraged [her] desire to make art,” moved to the San Francisco area, only to return when Murphy was 12. “I was going to get away after high school,” she explains. “But I ended up back in Wisconsin.” However, not before earning her BFA at the Rhode Island School of Design and MFA at Visva-Bharati in Santiniketan, India. These experiences provided her varied training in different mediums, including glass, clay, and printmaking, as well as styles, such as abstract, a style that was, for her, “more an experimentation with textures” and figure drawing. “I enjoy painting the most,” she says. “But I was very interested in technique.” Her desire to study and experiment with various techniques in a variety of mediums has a relevance and influence she still senses today. “Ready, About” by Pamela Murphy. To achieve the aged, antique quality of her work, she prepares her canvases by adding and removing several layers of paint – soaking them in water, creating a distressed surface. Before stretching the canvases, she paints the figures and objects, using charcoal to do detailed drawings, then white paint – “an indirect way of value painting,” she says. Finally, color goes on in a series of glazes, and she stretches and mounts the paintings using simple frames, painted to match the paintings they contain. The paintings that hung on the gray walls of Murphy’s studio now adorn Fine Line’s “Green Room,” a space reserved for their featured artists. Amongst the work of ceramic artist Stephanie Evans, the room contains a museum-like atmosphere: dim lights fall on the seemingly aged figures and objects depicted in Murphy’s work, while Evan’s ceramic dresses line columns and rows of shelves like antique toys or collectables. Pamela Murphy’s work will be shown at Fine Line Designs Gallery, which is located at 10376 Highway 42, through September 4. The gallery is open daily from 10 am – 6 pm, Sundays 10 am – 5 pm. Sally Slattery, a recent Winona State graduate, currently interns for the Peninsula Pulse Arts and Literature section. A visitor to the Door County area since she was a young girl, this season marks Slattery’s second to reside in the county.